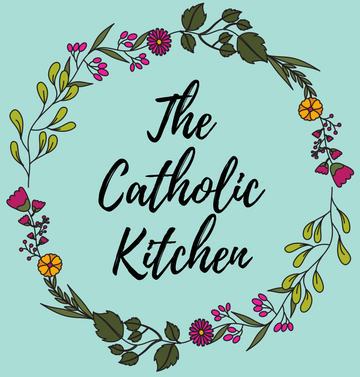 Cooking liturgically to share my love for God, one dish at a time. I am happily married to a very handsome and God fearing man. We have created four beautiful children here on earth, with two little saints in heaven we will surely meet one day. Our three daughters are amazing, and our son has an extra 21st chromosome which is just the cherry on top of an already sweet little boy. My husband is an active duty Marine officer, and I am a Marine Corps veteran myself. We love our country, and we are excited to keep moving around to different areas, seeing new places, and meeting new people. It is also fun to attend all the different Catholic churches in the various areas we live in. They are all so different, yet exactly the same. It always feels like “home” even when we’re in a completely different city. I love being Catholic. I was not born into the Catholic faith, but rather I discovered it during my early teens and dove head first into it in my mid twenties. My husband is from Barranquilla, Colombia where Catholicism is the norm. Where I grew up is considered right smack in the middle of the protestant bible belt. I went from Baptist, to Methodist, to Presbyterian, back to Baptist, and eventually on to not going to church at all. There was a period of 6-7 years where I did not actively go to church, but my interest in the Catholic faith never faltered. I officially joined the Church on August 16, 2014. The journey has been amazing! It has brought our family closer together, and I am continuously learning more as each day passes. I love to cook, bake, make freezer meals, try new kitchen gadgets, and learn about different cultural cuisines. I can’t wait to share all of my recipes with you! I hope you enjoy the website. I will be dipping into everything, doing giveaways, and releasing a really cool project soon! Thank you for supporting me. Lots of love and many blessings!